This roasted red pepper and tomato soup with fennel was originally posted in January 2016 and has been updated. Hey friends! Are you full force into fall mode (even though it’s not technically fall?) I am! I even bought gourds and mini pumpkins today. And I’m already planning for Halloween. Too much? Hubby usually dresses up as Nintendo’s Mario and I’m usually a random character or something. One year, I dressed up like a zombie and even did the whole fake cuts on my face. I will never do that again. It was fun, but boy was that adhesive rough on my skin. Eeeek! Ok, before I get way ahead of myself here, let’s take one thing at a time and ease ourselves into the cooler months ahead with a nice bowl of comforting soup – what ya think? This past Sunday, after some rest (and lots of coffee), I was all ready to get cookin’, so I made this spicy Roasted Red Pepper, Tomato and Fennel Soup. I love making big batches of soup on Sunday for hubby & I to enjoy throughout the week. This recipe is a super easy, super healthy AND delicious. Plus, it’s chocked full of veggies. There are only a few simple steps to this roasted red pepper soup. Basically, once the peppers are roasted, everything else is done in one pot right on the stove top. Nothing to it! Buying jarred roasted red bell peppers is super convenient. However, if you have time you can easily roast them yourself at home! They’re delicious in this roasted red pepper and tomato soup (obviously), but also really yummy on pizza, on a sandwich or even as a component to a charcuterie board. So, how do you roast bell peppers? Place them in the oven (second self from the top in oven). 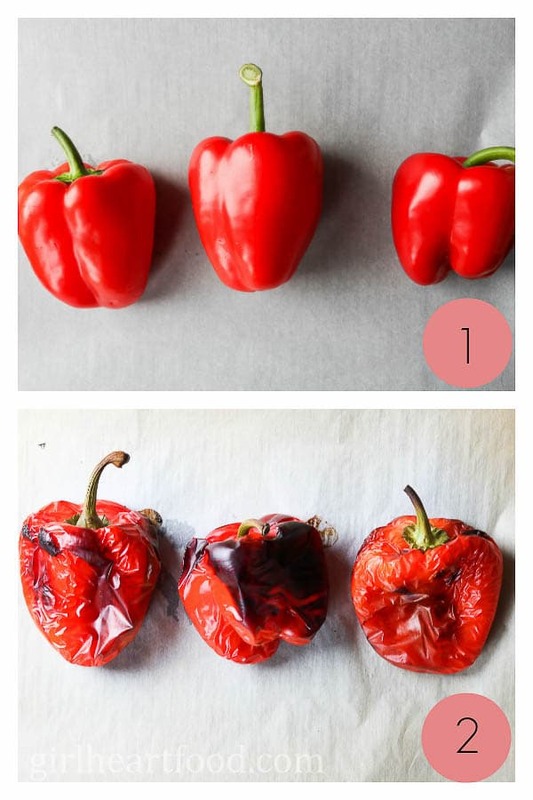 Carefully remove bell peppers from oven, place in a glass bowl, cover with plastic wrap and let ‘steam’ for a little to allow the exterior charred skin to loosen. Now it’s ready to use in recipes! Use the best quality canned tomatoes you can get. I love to use whole San Marzano tomatoes and blitz them with an immersion blender prior to using them in this recipe. You can also squish the tomatoes with a potato masher or by hand. I love to use unsalted vegetable stock in my soup recipes – that way I have better control over the salt content. 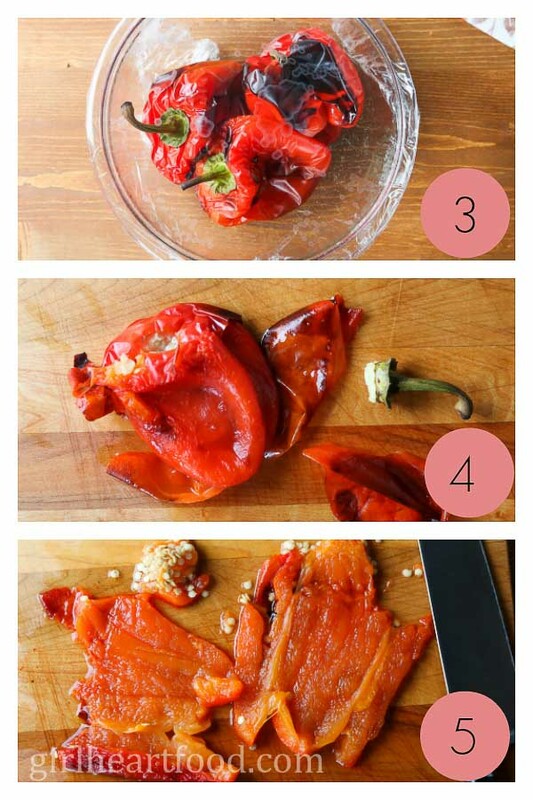 Don’t have time to roast bell peppers? No worries! You can buy them at your grocery store in jars and they’re ready to use! Want your roasted red peppers more charred? 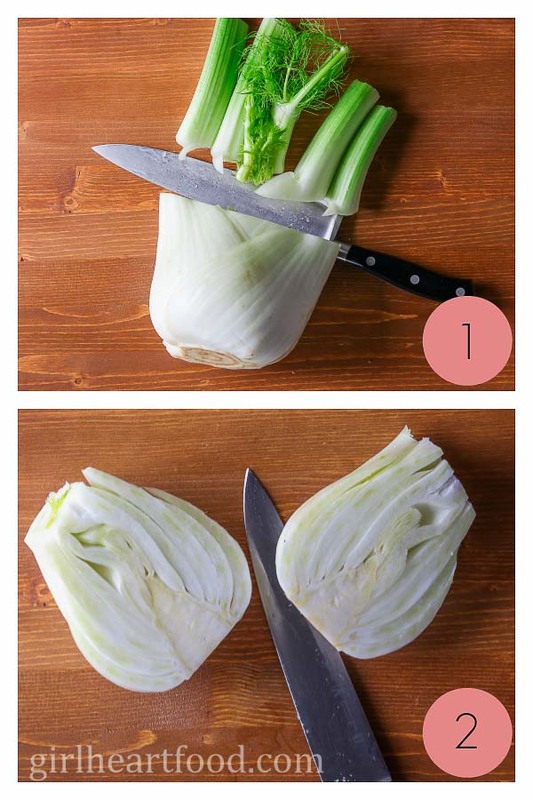 You can also broil them for about 8-10 minutes, carefully turning part way through. Keep in mind, though, that your parchment paper may need to be ok for the higher temperature or it may scorch (or you can simply omit the use of parchment paper, but it will probably leave your sheet pan a little messy). I used two Thai chili peppers in this soup and it wasn’t too spicy for me. You can use less or omit entirely and the soup will still be delicious! When I originally made this roasted red pepper tomato soup, I garnished it with crumbled goat cheese. However, for this updated version, I opted to spread some goat cheese on crostini and served it alongside for dunkin’. You do you! Speaking of goat cheese crostini, for those I toasted some baguette pieces and spread with goat cheese. Then, sprinkle with chili flakes and balsamic drizzle. 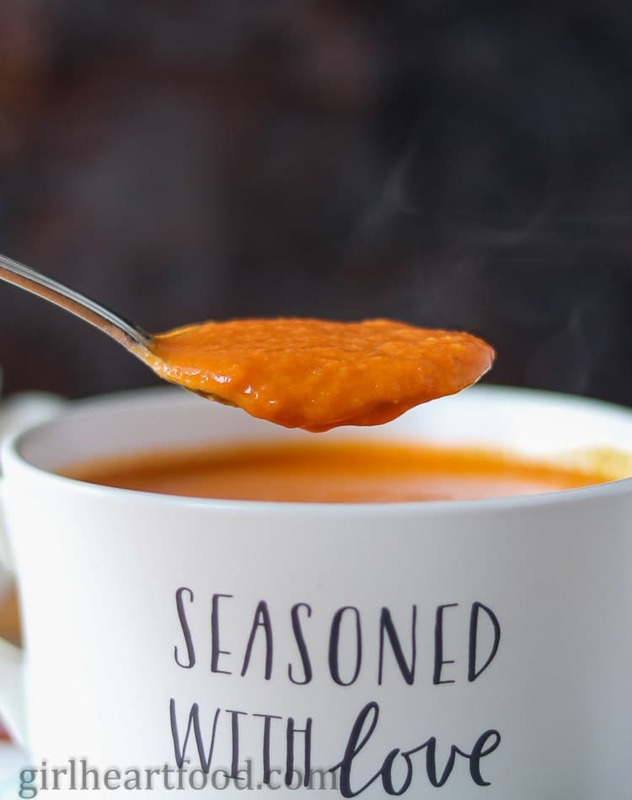 If you want to make your meal a little more substantial a grilled cheese sandwich would be a great sidekick to this roasted red pepper soup too! 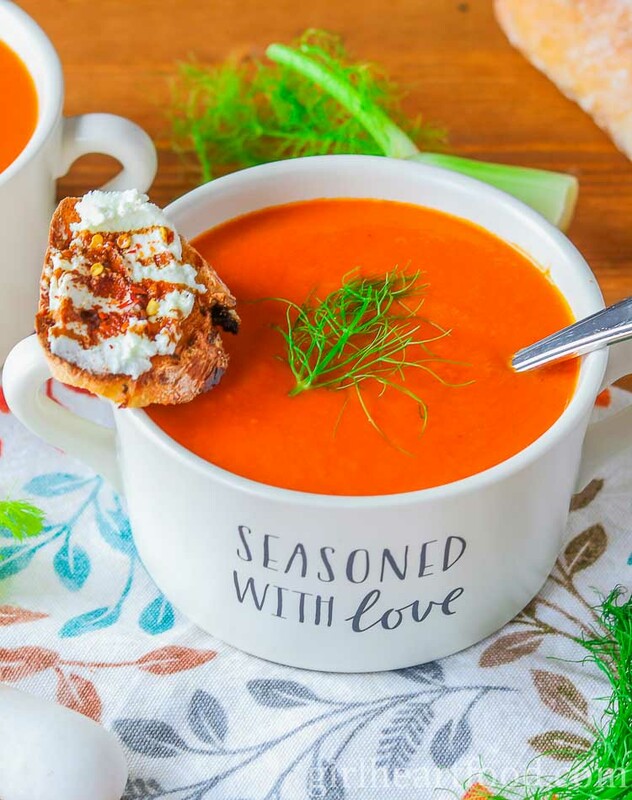 Hope you love this roasted red pepper and tomato soup! Easy, comforting and delicious, this Roasted Red Pepper and Tomato Soup with Fennel will warm you up on the coldest of days! Delicious with goat cheese crostini on the side for dunkin'!'! Preheat oven to 420 F. On a parchment lined baking sheet, add bell peppers. Bake 40 - 50 minutes, turning half way through. Carefully remove from oven, place in a bowl, cover with plastic and let sit for about 10-15 minutes until cool enough to handle. Remove stems, outer charred layer (I don't mind if some charred pieces are left on) and bulk of inner seeds (few stray ones left are fine). Reserve any juices as well. Place to one side for later use. While the bell peppers are roasting, on medium low heat add 1 tbsp. of olive oil in dutch oven or pot. Cook for 5 minutes, or until onion has softened. To onion, add garlic and chili and cook for a minute. Add fennel to onion mixture. Season with salt, pepper and oregano. Cook for about 10 minutes, until fennel has softened. To vegetable mixture, add stock, tomatoes and reserved roasted red peppers. Bring to low simmer, cover with lid ajar and cook about 15 minutes. Off heat add Greek yogurt and blend with immersion blender. Portion into bowls, garnish with fennel fronds and goat cheese crostini (or crumble goat cheese directly on top of soup). Enjoy! I love to use unsalted vegetable stock in my soup recipes - that way I have better control over the salt content. 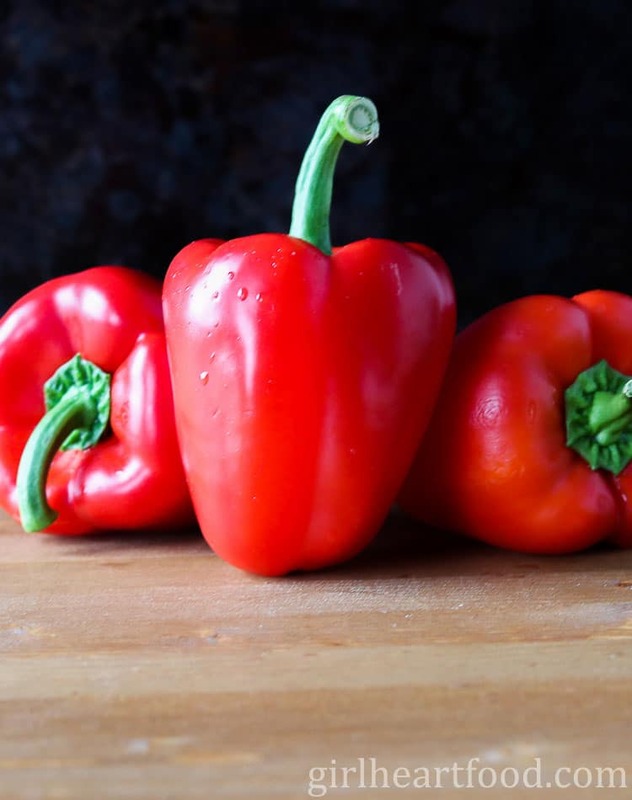 Don't have time to roast bell peppers? No worries! You can buy them at your grocery store in jars and they're ready to use! I used two Thai chili peppers in this soup and it wasn't too spicy for me. You can use less or omit entirely and the soup will still be delicious! When I originally made this roasted red pepper tomato soup, I garnished it with crumbled goat cheese. However, for this updated version, I opted to spread some goat cheese on crostini and served it alongside for dunkin'. You do you! This recipe couldnt have come soon enough! I want to make it and dip a grilled cheese in it! YUM! Sounds like a delicious plan 🙂 Thanks Kevin! Ohhh this sounds so good! Perfect for fall. I love the combo of flavors. I bet fennel really adds some complexity to this soup. This looks amazing! 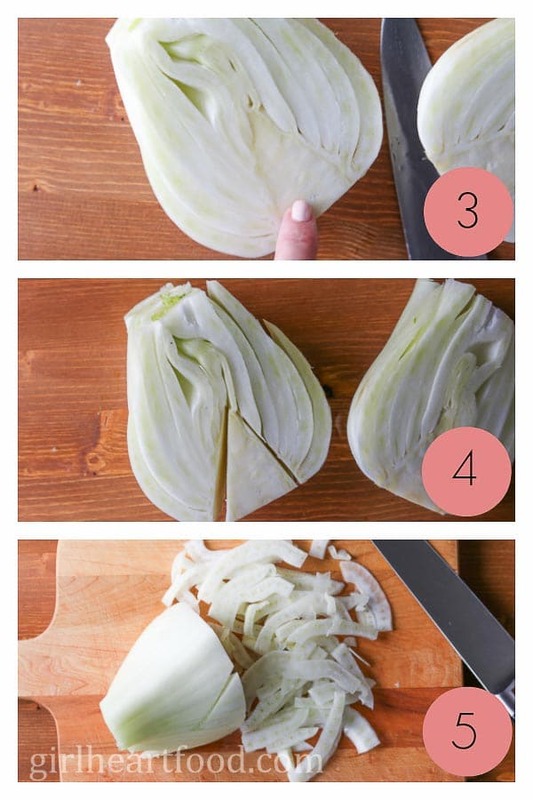 Super easy to make and very creative .. perfect for busy weeknight dinners or a hearty lunch! This looks like such a delicious combo. 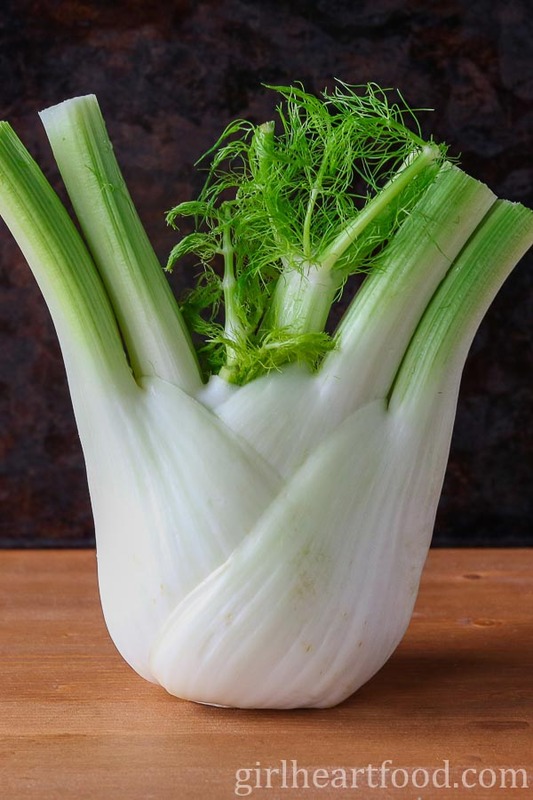 Fennel is such a great flavor to add seasoning to savory dishes. And I ALWAYS have peppers in the fridge. Can’t wait to try this! I had the most amazing tomato soup at a Gordon Biersch restaurant last summer and I’ve been diving in head first to try all sorts of recipes to recreate it! I love all the herbs and seasoning because that’s how you know it’s loaded with flavor and delicious! This looks so good. I wonder how “peppery” it is. Can’t wait to try. It is about to be soup season at my house and I am going to be starting with this one! Looks and sounds so good! Happy to hear that! Thanks Kelsey 🙂 Enjoy! This soup looks like it would be perfect on a cool day. I really love the addition of the fennel to this soup, sounds delicious! Totally! It’ll warm ya right up 😉 Thanks Sharon! I’ve made a lot of different tomato soups, but I never thought to add fennel. What a great idea! And that goat cheese crostini looks amazing! Thank you Daniela 🙂 The crostini are great for dunkin’! I have lots of tomatoes to use up from my garden, and I always turn some into soup or sauce. Love the addition of fennel here! This soups is gonna be great in a few months when I pull it from the freezer on a cold day! This soup looks amazing!! I have never put goat cheese in my soup before, but it is definitely on my list right about now.